When you think of Mondrian, lines and shapes come to mind, but he didn’t always paint like that. Based on what their paintings look like, you’d probably assume that a guy like Mondrian would have nothing in common with Jackson Pollock. Pollock’s carefree, swooping gestures are the antithesis of Mondrian’s rigid lines and strict adherence to primary colors. You might be surprised to find out that both artists were interested in Theosophy, a spiritual approach to religion and philosophy that preached universal values like unity and harmony among all things. Despite how differently they painted, Theosophy informed these artists’ approach to what they considered both beautiful and necessary for the worlds in which they lived. But before Mondrian became the artists we associate with black lines and rectangles of primary colors, he was an entirely different man. Before 1911, he painted nature scenes in a style that imitated that of Van Gogh. That is, until an exhibition at the Stedelijk Museum exposed him to the wily geometric ways of Cezanne, Picasso, and Braque. He then left Amsterdam for Paris, where he could be closer to the artists who had changed his understanding of both art and life. After moving to Paris, Mondrian fully immersed himself in the Cubist movement and went totally abstract. You’d never guess that Mondrian based Composition 8 on the facade of a Paris church. This is because Mondrian dissected the building’s architecture into solely the shapes, lines, and planes. Over time, he only became increasingly committed to total flatness. He even went so far as to design frames that further flattened his works. He believed that traditional frames, usually made from ornately-carved wood, created too much depth in the painting. Eventually, Mondrian’s art and life merged into one expression of his beliefs in Theosophy and his aesthetic approach. He began expressing his thoughts in rambling writings that, often times, make little sense and really just sound like a crazy obsessions over lines. But Mondrian truly believed that this translation of reality into simple lines and colors could solve the world’s problems, primarily brought on by the relentless fighting of the World Wars which uprooted his life multiple times. Although Mondrian based Composition 8 on Parisian architectural studies, he painted this work in Holland, where he was forced to take refuge to escape the fighting in Paris during this time. He believed in his philosophy of simplicity so wholeheartedly that he began to transform his studio spaces into lifesize iterations of his paintings. Wherever he was currently living, Mondrian made his studio look just like his paintings. This proto-hippie approach to art as a key to harmony, unity, and happiness helped Mondrian deal with the chaos of his life during the World Wars. Each time he had to move to a new place and set up a new studio, he created his perfect vision of peace. Who knew that lines could be so happy? Artsy Editors. “How Mondrian Went Abstract.” March 20, 2015. https://www.artsy.net/article/matthew-how-mondrian-went-abstract. Accessed December 28, 2018. Blessing, Jennifer. “Composition 8.” Collection Online. Solomon R. Guggenheim Foundation. https://www.guggenheim.org/artwork/3008. Accessed December 28, 2018. Lebowitz, Rachel. “Mondrian Turned His Studios into Giant Abstract Paintings.” Artsy. March 7, 2017. https://www.artsy.net/article/artsy-editorial-mondrian-turned-studios-gi.... Accessed December 28, 2018. Tate. “Room Guide.” Mondrian and his Studios. Exhibitions & events. 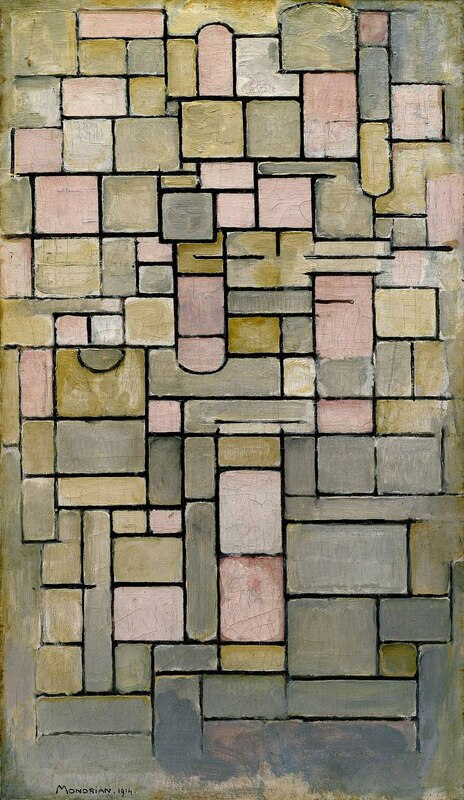 https://www.tate.org.uk/whats-on/tate-liverpool/exhibition/mondrian-and-.... Accessed December 28, 2018.